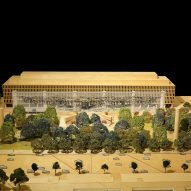 The controversial memorial to former US president Dwight D Eisenhower, designed by Frank Gehry, has finally begun construction in Washington DC after years of opposition. A groundbreaking ceremony for the project was held yesterday, at the site on the National Mall where the $150 million memorial will be built. Honouring the 34th president of the United States, the monument has been in planning for many years. But the design has faced multiple rounds of criticism from relatives, government officials and members of the public. Eisenhower led the US from 1953 to 1961, and served as an army general during the second world war. 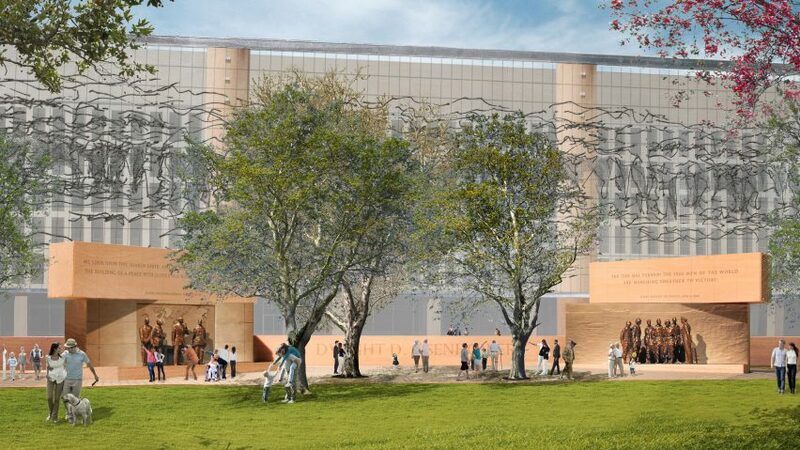 Set in a landscaped park, the giant stone and metal memorial will depict scenes from his time in the forces, his upbringing in Kansas, and events like the signing of the first Civil Rights Act since Reconstruction. "This project has been an enormous honour for me both professionally and personally," said Gehry following Thursday's ceremony. "I was 16 years old when Eisenhower defeated the Nazis and led American to victory in world war two. I had lost 33 members of my family in the camps, so his victory was all the more meaningful to me." Members of the Eisenhower family withdrew their rejections to the project in September 2016, allowing for planning to move forward. Several attended the groundbreaking ceremony. They were initially concerned that the memorial design was too extravagant, and that its metal mesh "tapestries" would be likened to the Iron Curtain – the name given to the boundary that divided Europe during the Cold War. The family's objections were joined in 2013 by legislators who argued that Gehry's project was too costly and controversial, but they dropped their opposition after the design was revised. Before the proposal was first submitted for planning approval in 2011, the Canada-born architect said he would take on board remarks from the public about the memorial's scale. The Eisenhower Memorial Commission, the organisation overseeing the project, was formed as far back as 1999. After a turbulent competition process, the commission officially selected Gehry's design in 2010. Following the groundbreaking ceremony, construction will begin immediately. The memorial is during to be dedicated on 8 May 2020 – the 75th anniversary of the second world war's end. Gehry is one of the world's best-known architects, and won the profession's Pritzker Prize in 1989. His significant projects include the Guggenheim Museum in Bilbao, the Walt Disney Concert Hall in his home city of Los Angeles, and the Fondation Louis Vuitton in Paris.